Spanakopita is a heavenly pocket of deliciousness! This was my first time making these and I was so surprised at how much I love them! All of the ingredients used are things I love, but putting them together in a pastry dough brushed with melted butter is amazing! Try out this recipe and let me know how you liked them. Enjoy! Thaw the pastry dough in the refrigerator overnight, not on counter. Thaw the spinach and drain. Squeeze out any more excess water with paper towels. Place in a medium bowl. Chop the scallion in the 1 teaspoon butter for about 4 minutes. Cool. Once it has cooled add to the spinach. In a small bowl beat the egg. Add to the egg mixture salt, pepper, basil, oregano, parsley, oil and lemon juice. Mix to incorporate. Add this to the spinach mixture and mix well to incorporate all of the ingredients. Add 5 ounces of the feta cheese and mix through. Save the rest to place around the pockets when being served. Carefully remove the dough from the box and place on a large surface. Take a wet dish towel and cover the dough to prevent it from drying out. Melt the butter and allow to cool slightly. Working with 2 sheets of dough at a time, move 2 pieces layered on top of each other to a large work surface where you can lay the sheets flat. Brush them lightly with the melted butter. Divide the dough lengthwise with a sharp knife. Take 2 tablespoons of the mixture and place it in the bottom middle section of the three sections. Take the bottom right corner of the strip between your thumb and finger and fold over the spinach filling to the left to make a triangle. Gently pull up the bottom left corner and fold up to make a second triangle. Continue folding until you reach the top. Place the triangle, seam side down, on the prepared baking sheet. Brush the completed triangle lightly with butter. Place in a preheated 350 degree oven for about 20-22 minutes, until golden brown. Allow to cool for about 5-10 minutes before eating since the center will be very hot. Serve with the rest of the feta and garnish with some chopped parsley. Enjoy! Hi Tanu, thank you so much for the comment and request. Let me know if you are interested in vegetarian or non-vegetarian. Looks great! Could you use a different type of cheese? Hi, and thank you for the comment. 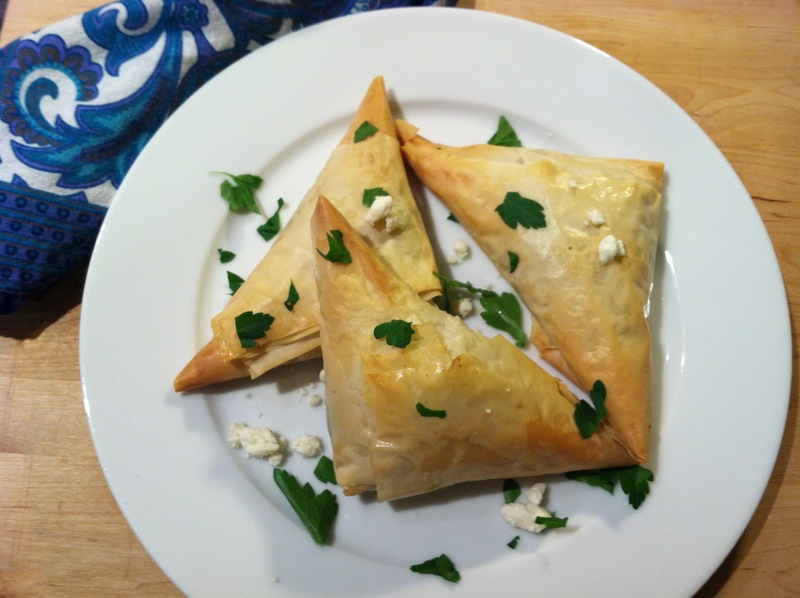 Yes, some people use goat cheese, although the classic Greek dish calls for feta. The feta gives it just the right amount of saltiness and texture, where I think the goat would be milder and melt. But try it either way and write back with your results, will love to hear from you again. You’re welcome Tanu, and thank you for your comment!